I have received numerous criticisms of late to the effect that I am too positive about Korea. Although I think my writings do contain numerous criticisms of Korean practice, it is certainly true that I go to great lengths to keep the tone constructive and positive. That said, I have decided to give a short list of serious issues with Korea that I have. So many times we find at Korean restaurants that the cooks feel that they have to squirt a white or brown sauce in lines on top at the food at the last minute to make it look better. The sauce does not add to the flavor and I wish we could just eat the food. Amazing to witness how quickly new campaign to encourage people to drink less as part of their work has gained speed in Seoul. There are signs on the subway, in workplaces, government offices and on TV aggressively driving this point home. A fascinating article by Professor Sin Buyong, Director of KAIST’s new “Hangul” Engineering Institute” in which he argues for the broad application of the Korean hangul script globally. Korea is starting to expand the concept of technology to include many new applications, and this concept of hangul as a universal script that can more accurately, and more simply, represent all languages is particularly striking. What is new here is the Koreans are not merely proposing more people in the world should learn Korean, but also that they could better write their own languages using the hangul script. 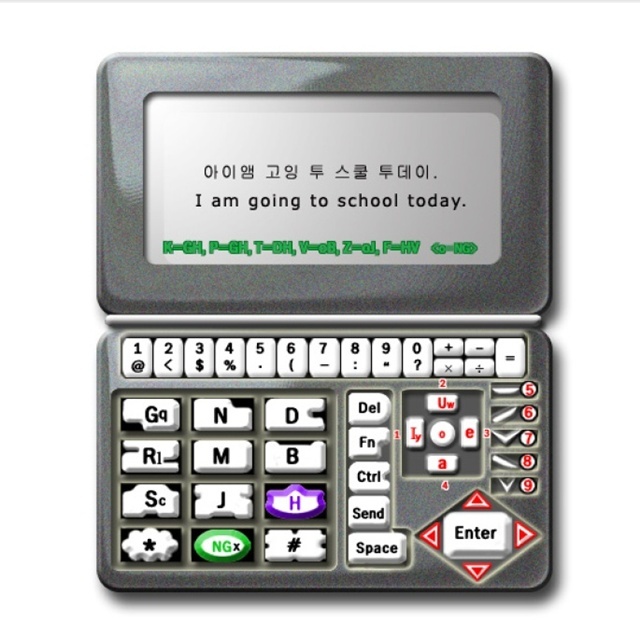 Professor Sin presented in a previous article an input device employing hangul and demonstrates how hangul is better than the Roman script for inputting English. I am not sure how realistic this example is, but it does suggest a new self confidence and creativity which is most welcome. Demonstration of the greater efficiency of Hangul script over Roman script for inputting English. There are two major cultural challenges that Korea faces today as it suddenly finds itself playing an international role on a scale that no one had imagined could happen so soon. Both challenges relate to Korea’s cultural identity, and both may seem somewhat obscure to internationals unfamiliar with the specifics of Korea’s cultural experience. The Asia Institute recently held a round-table discussion on the topic of technology convergence. The discussion was led by Dr. Emanuel Pastreich, Professor of Humanities at the Humanitas College of Kyung Hee University. Also in attendance were Charlie Wolf, Director at the Social Impact Assessment Center in the Greater New York City Area; Paul Callomon, Collections Manager at the Academy of Natural Sciences in the Greater Philadelphia Area; Stephanie Wan, the YGNSS Project Co-Lead and the North, Central America & Caribbean regional Coordinator of the Space Generation Advisory Council; Daniel Lafontaine, Business Coach and Consultant at AMA Korea; Alan Engel, President at Paterra, Inc. in Japan; Matthew Weigand, founder of Responsiv.asia and former editor of the Korea IT Times; Tahir Hameed, Research Fellow and PhD Candidate at Korea Advanced Institute of Science and Technology; and Vince Rubino, Global Team Leader of Business Development and AQ at the Korea Institute of Toxicology. In this third part of a five-part series, the experts discuss the true definition of the term convergence that is so easily thrown around these days. Matthew Weigand: Personally I’ve always thought that the term Convergence was broad and generalized for political reasons – it encompasses the greatest possible meaning because people would like it to. Nailing it down to any one specific meaning would be marginalizing some segment of new technologies which want to claim the label for financial or political reasons. So I guess Emanuel’s take on breaking down convergence into sub-categories would be the only way to make any headway on discussing it. Emanuel was invited as a speaker at the Byeung-ju Lee International Literary Festival in Seoul on September 29, 2011. The Festival brings together important writers and literary critics to discuss contemporary literature and its significance. Emanuel was on a panel with the Chinese novelist Dong Xi (東西) and the Japanese horror writer Kishi Yusuke (貴志祐介). We also spent a day in Hadong, at the base of Jili san Mountain. Hadong was the long term resident of Lee Byung-ju, author of many novels on the social conflicts of Korea in the 20th century. His most famous novel Jili san is the epic of a family torn apart by ideological conflicts. Professor Scott Strobel, Vice President for West Campus at Yale University, has taken a deep interest in Korea of late. He recently wrote this very thoughtful article about Korea’s possible future role in science and technology. 한류(韓流)가 세계를 휩쓸고 있다. 한국발 사랑 노래, 스릴 넘치는 영화, 시선을 떼지 못하게 하는 TV 드라마가 새로운 세대는 물론 기존 세대의 상상력까지 사로잡고 있다. 이렇듯 한류가 한국의 이름을 알리는 데 널리 공헌하고 있다지만 궁극적 의미에서 진정한 지적(知的) 한류는 아직 시작되지 않았다.